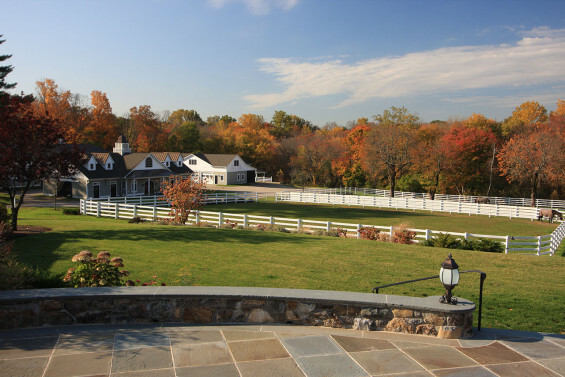 Steeple Chase Farms, a 13 acre private residential horse farm located in Greenwich, CT, includes a 7,000 sq. ft. home, stables, indoor riding arena, grazing paddocks, run-in sheds and an equipment garage with groom’s quarters. The architecture, inspired by the late 19th century shingle style homes made popular by the likes of Stanford White and H.H. Richardson, was carefully fitted to the topography in collaboration with Architect Paul Marchese. 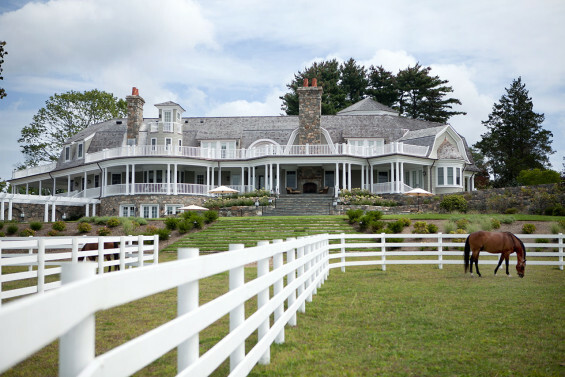 The goal was to create a working equestrian facility for this client and her family while incorporating all of the comforts of home in a residential setting. Coming up with a plan that would satisfy the town’s Planning and Zoning Commission and respect the residential character of the neighborhood was a primary role for Conte & Conte, LLC. Coming into the project as the Landscape Architect, Mr. Conte arranged the site plan, positioning the proposed recreational areas, circulation, and building sites in order to reduce the impact of views for neighboring properties. The house was placed in such a way as to preserve a large stand of trees, setting it high atop a rolling hillside. This allowed for sensational seasonal views of its verdant setting. The equestrian buildings were set down, lower on the property and arranged to fit into the topography instead of overpowering it. 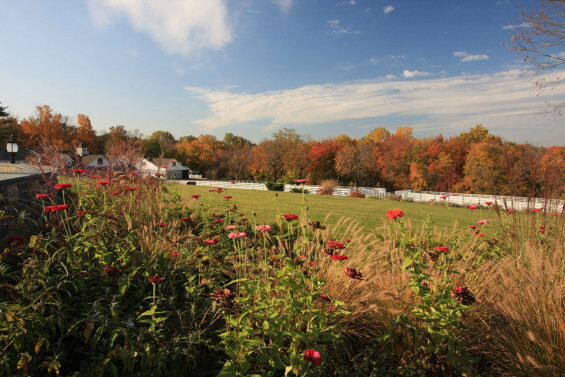 Mr. Conte arranged the huge indoor riding arena behind an existing stand of tall White Pines, which belies its size and anchors it into the landscape. The 8 stall barn, which also houses a private sitting room and tack room, is used as a frontage for the other utilitarian structures to subordinate them. The barn sets off the symmetrically arranged paddocks, treating them as if they were large formal gardens with a cross axis leading to the run-in sheds. This carefully arranged order allows these elements to recede into a picturesque view which can all be comfortably taken in from the elevated position of the home. The owner is also an avid gardener and wanted a large vegetable garden within easy reach. 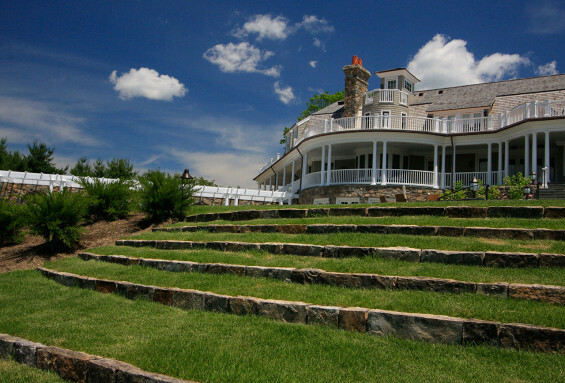 Rather than being relegated to a distant corner of the property, the garden is featured and integrated into the terracing immediately surrounding the main house. 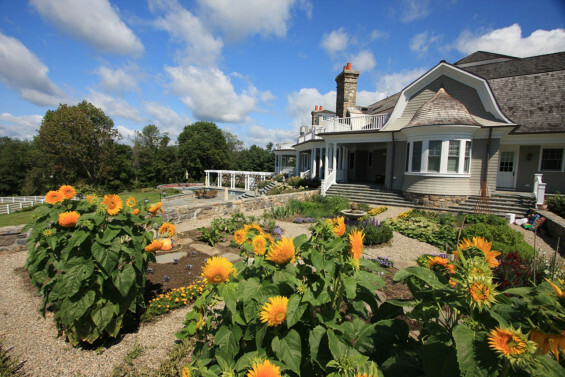 Under the owner’s expert care, it generates an abundance of flowers and produce including antique varieties of herbs, lettuce, tomatoes, peas, blueberries and pumpkins annually.